In the early hours of the 7th of July, the action day against the G20 summit started with blockades of the delegates routes and of the harbour. Even in the forbidden zone, declared by a general decree, thousands of summit opponents came together for smaller and bigger actions and participated in diverese actions. Unfortunately – just as on the day before – people got injured. On the way from Berliner Tor to Mundsburg, a protestor in St. Georg was run over by a police vehicle, they drove on without stopping. The following vehicles of the police convoy only stopped when other people protected the injured person on the road by standing infront of them. The police got out – not to provide first aid, but to disperse the first responders with pepperspray. Later in hospital, the police took the details of the injured person and tried to interrogate them. During the afternoon, street medics were called to tend to the injured on the Fischmarkt. In the Hafenstrasse, the paramedics got caught in a police control, but could pass after alerting the police of their function as street medics. After not finding any injured person, the paramedics stopped about 500 meters from clashes between protestors and police. 20 minutes later a large police unit (Hundertschaft) came running and pulled the driver and her passenger out of the car. The police held the passenger in a headlock, threw the driver to the ground and stepped on her head and shoulder. She was bruised on the collar bone, upper arm and shoulder and needed to be treated in hospital. Her glasses had fallen to the floor and were crushed by police. While the police took the details of the street medics, they themselves refused any identification. A dozen detentions were reported to the legal team (EA) from a blocade on Friday morning on the corner Schnackenburgallee/Rondenbarg. Many of these were injured. People fleeing from the police violence tried to scale a 4 meter high fence, which broke down under their weight. Here the police provoked a panic situation without any regard. The result: 14 injured in hospital, of which 11 seriously injured. In this situation it is not surprising that the Autonomous Street medics meanwhile have to ask for donations for dressing material. The maxim of the head of operations of the Hamburg police is as brutal as it is cold-blooded: Rather leave injured behind than take prisoners. 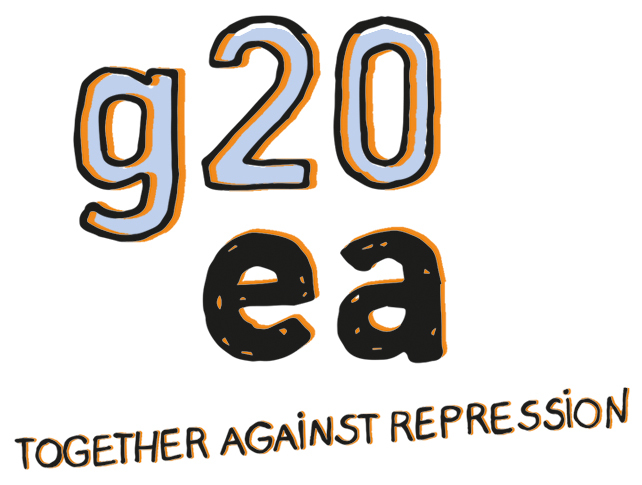 #NoG20 #Hamburg July 9: Live-Blog Demo to #G20HAM17 Prison | Enough is Enough!